Following its primary listing on the Johannesburg Stock Exchange (JSE), and secondary relisting on the Zimbabwe Stock Exchange in June 2018, Old Mutual has unveiled a vibrant new brand identity, to reflect its fresh customer-led approach and stronger focus on Africa. The company's new visual personality draws on the optimism, vibrancy and seize-the-day spirit of the continent, reinforcing the message of 'Made in Africa for Africans'. 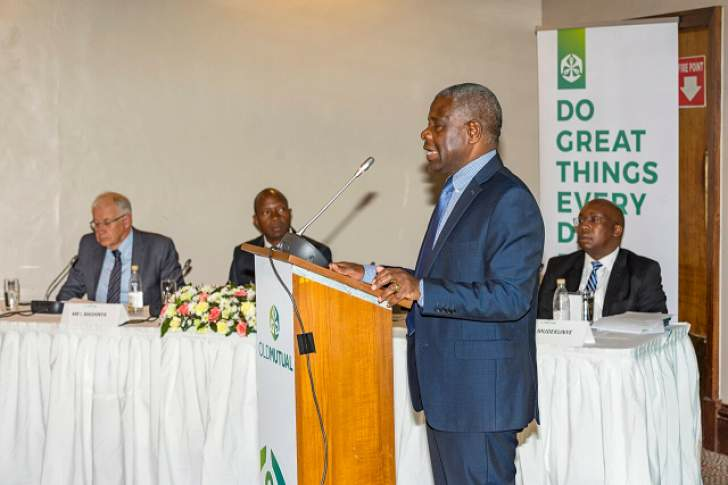 Old Mutual Zimbabwe Group CEO and Rest of Africa CEO, says that the new brand repositioning represents much more than a brand refresh. "As an independent entity with ambitious aspirations and a clearer, stronger focus on Africa, we saw the need to establish ourselves more firmly as an effective Pan-African leader with a distinctive customer value proposition," he says. "With that came the need to review, reposition and reinvigorate our brand. "We have re-imagined and strengthened our role and relevance in our customers' lives. Increasingly, customers tell us that what they need from their financial services provider is closer involvement and understanding, and practical, hands-on support. In short, we will be cutting through the intimidating clutter of the financial sector, and serve more as coaches or partners, providing tools and motivation, helping them take the small steps that lead to great things. "This is why our brand identity has been given new vibrant refresh: to express our revved-up purpose to equip and guide our customers to become financially fit and be their absolute and exceptional best." Mushosho adds that Old Mutual is proud to be one of Africa's most reputable, recognisable and reliable financial services brands. Over the 173 years of its existence, Old Mutual has gained vast experience and demonstrated resilience and foresight in adapting to meet the evolving needs of customers and markets. Now, with operations in 13 countries in Africa, the company is ready to seize the opportunities for growth in the African financial services market. Thobile Tshabalala, Old Mutual's Head of Brand, describes the repositioning of the brand as "a brave tightrope balancing act". Importantly, the brand evolution cannot be seen as an event, but rather a progressive build on Old Mutual's customer centric approach. The group has just launched the Old Mutual Rewards programme in South Africa, and will be rolling out many other innovative solutions and initiatives over time, to realise its vision. She explains: "Old Mutual's brand evolution has been carefully managed since its founding in 1845, and it's been critical to keep the key associations and core brand values integral to the #TheTimeIsNow advertising and marketing campaign. "This means that on the one hand, we had to ensure continuity, and on the other, we had to show how the company is generating a pulsating new energy. One of our main aims is to win over a new generation of customers whose needs, preferences and expectations are being shaped by a creative youth culture and access to ever more sophisticated technology. "The company will retain its iconic anchors logo and its primary shades of green, but several energetic secondary colours - think pink, orange and sunshine yellow - signify a dramatic break with the past and bring the new brand personality to life. Our visuals incorporate many traditional patterns, illustrating the richness of our African culture." The images used at various touchpoints, including TV, print and outdoor, speak of hope and optimism, liberation and a warm sense of community, reflecting Old Mutual's responsibility to its communities and its responsible investment in inclusive economic growth that benefits everyone. "We are excited to be part of the (r)evolution of this great brand. To build relevance and affinity with people across Africa, we worked with our client, as well as our partner agencies across the continent, to create the communication campaign. Our strategic partnership with Old Mutual helped us get to a strong insight and a bold, simple proposition. 'The Time Is Now' is a call to action and a rallying cry. Our campaign is motivational, inspirational, vibrant and dynamic," says Jonathan Beggs, Executive Creative Director of Publicis Communications. Mushosho concludes: "The time is now to realise the potential of our customers and the markets we serve. We firmly believe that the secret to getting ahead is starting with the small steps. Wherever you're at, being exceptional starts right NOW. There's so much power in flinging procrastination aside and taking immediate charge of your finances to build a great life."